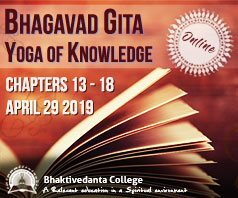 Hema Jagannatha Dasa: ISKCON of Central NJ (ICNJ), Plainfield celebrated Sri Rama-Navami on Saturday 4/13/2019. 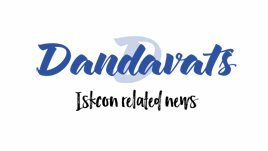 Lord Jagannath was adorned with Ramachandra Vesha of breaking the Shiva Dhanu, inspired from other ISKCON temples. The main altar area was decorated nicely to provide a devotional vibe about the festival. Devotees performed abhishek of Sri-Sri-Rama-Parivar. Everyone got fruits, flowers and nuts for the pleasure of the Lordships. 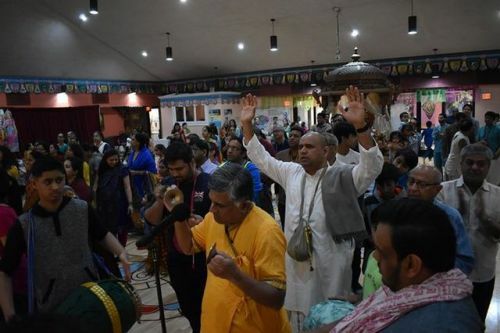 During Abhishek, ICNJ devotees sang “Ramachandra Raghuveera”, “Sri-Ramachandra Kripalu Bhaja mana” and many other melodious Rama Bhajans which captivated the mood of devotees. The Drama Team of ICNJ prepared a drama titled “Lord Rama’s visit to Grouchy City” depicting the lessons devotees from Kalyug should learn from Ramayana” The extended celebration continued on Sunday 4/14/2019 with classical dance presentations. Around 600+ devotees attended this 2-day celebration of Sri-Rama Navami at ISKCON Plainfield, NJ temple.